Do you know that 80% to 90% of diseases in the human body are closely related to our immune system? This article gives you an overall understanding of how the self-defense function of our immune system works and how ganoderma modulates our immune system, including controlling cancerous tumors. 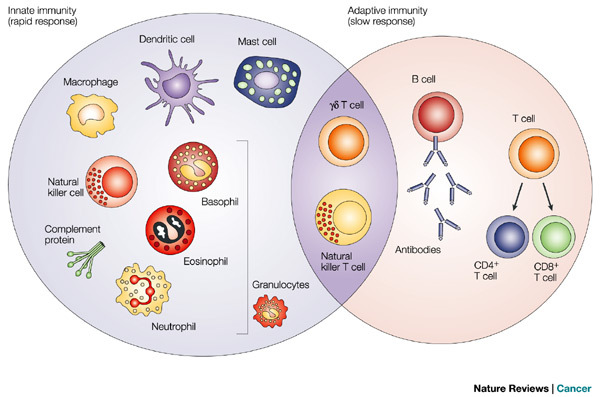 B cells, responsible for producing antibodies. Normally there are between 3,500 to 9,000 white blood cells (WBC) in a micro-liter of blood in a healthy person. When WBC count is less than 3,000, the immunity is weak and the body is prone to sickness. When WBC count is over 10,000, the body has an infection and more WBC is produced to eliminate the pathogens. When WBC count is extremely high, the body may be suffering from an auto-immune disease (e.g. asthma, SLE (systemic lupus erythematosis), rheumatoid arthritis, ankylosing spondylitis, scleroderma) or leukemia. 2) he recovers quickly when sick. 1) Non-specific / innate immune response. 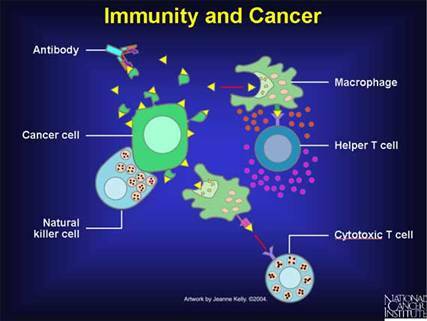 Front-line immune cells are the phagocytes and natural killer cells. 2) Specific / adaptive immune response. Second-line immune cells are the T cells and B cells. 1) It destroys the harmful pathogens that invade our body. 2) It activates the adaptive immune response, by informing the T cells of these pathogens. Antibody production is triggered and the T cells memorize the pathogens to accelerate immune response upon future encounters. Ganoderma reinforces and strengthens the phagocytes, so that the timing for initiating the innate response can be triggered quickly. The pathogens can be quickly eliminated and thus prevent further invasion. It boosts up our immune system and increases the number of immune cells. Researchers report that mice taking ganoderma have a stronger immune system. 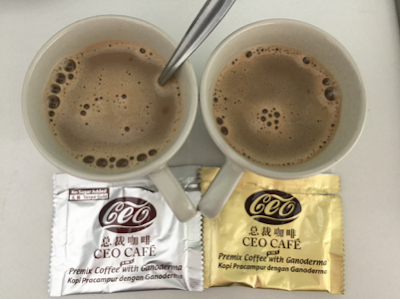 A study by Professor Sheng-Yuan Wang of Taiwan Yang Ming University found that ganoderma can suppress tumor cells. In 2004, Prof Chi-Huey Wong from Taiwan's Academia Sinica found results that demonstrated the anti-tumor activity mechanism for a ganoderma polysaccharide. NKC makes up 15% of WBC in the human blood. NKC are in charge of terminating mutated/cancer cells before these cells turn into malignant tumors. The less active the NKC, the more active and serious the cancer progression. Prof Da-Cheng Dong at Taipei Medical university found a significant increase in the NKC activity based on a clinical study on healthy adults. This is further supported by a similar study carried out following the official validation method for immune modulation established by the Department of Health of Taiwan. NKC activities in the human body may be enhanced by long-term consumption of at least 5 capsules of Yung Kien Ganoderma per day. If the number of viruses and bacteria is too high, it is beyond the capability of the Front-line immune system. They die and along with other dead cells, all these dead materials pile up in the body, resulting in symptoms like redness, swelling, inflammation or even suppuration (formation and discharge of pus). 1) Cytotoxic T cells (Tc). When T cells receive information sent by Phagocytes on the characteristics of the pathogens, they will propagate so that Tc cells are ready to mount a strong response should they encounter the same pathogens. 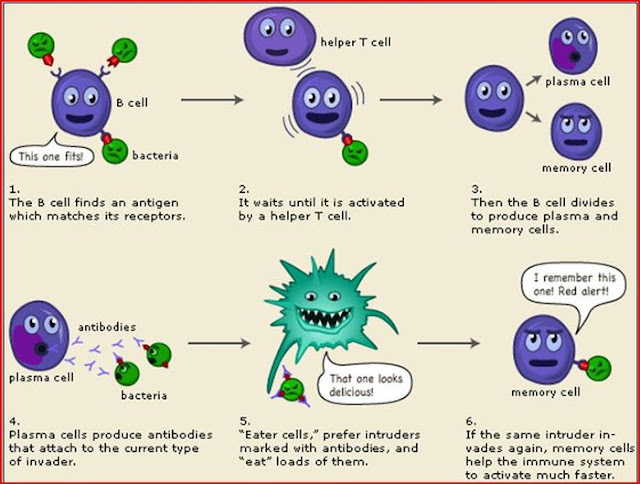 2) Helper T cells (Th). They "key-in" the info received to the "pathogen database" and familiarize other Phagocytes and B cells with information on the pathogen. In order to accomplish the numerous tasks, Helper T cells differentiate into 2 types of Helper cells which are in charge of different types of immune responses. They will decide what kind of weapons to employ to destroy the enemies in this immune war. (i) Helper T cells 1 (Th1). Assist Tc cells. (ii) Helper T cells 2 (Th2). Help B cells in producing antibodies, especially a type of allergy antibody called IgE (immunoglobulin) that plays an important role in allergic asthma reaction. The optimal Th1/Th2 balance is when there is more Th1 cells than Th2 cells. Increase in Th1 cell activity helps to strengthen immunity and declines in Th2 assist in modulating immunity and avoiding allergic reactions. Loss of this balance may induce immune disorder diseases such as allergy, peripheral neuritis, Crohn's disease, rheumatoid arthritis, ankylosing spondylitis and SLE. The conventional clinical treatment include steroids and immuno-suppressive drugs. An animal test suggested that mice taking ganoderma had more Th1 and less Th2 cells. Ganoderma strengthens immunity in times of low immunity (polysaccharide) and lowers immunity in times of over-reaction (triterpenes) - i.e. "capable of modulating T-cells function". In other words, there are 2 substances with contrasting mechanisms existing in the same ganoderma, and they share the same goal despite their differences. The 2 substances work together simultaneously, helping Th1 enhance immunity and Th2 prevent allergy. That is how ganoderma modulates our immune system. When Th cells transmit information on pathogens to B cells, B cells examine them, identify the weaknesses of the pathogens and figure out how to annihilate the invaders. They turn into plasma cells to produce antibodies. Similar to the need for sufficient soldiers and the correct weapons in order to win a war, the T cells need B cells and the antibodies to win the immune war. 1) IgA - exists in tears, respiratory and digestive tracts. 3) IgE - unite with mast cells that secrete histamine to cope with tissue damage or pathogens resulting from insect bites etc. 4) IgM - first to appear upon entry of pathogens. 5) IgG - next to appear after IgM. The greater the number of B cells, the more antibodies (ammunition) can be produced. These antibodies save the information on pathogens in their long-term memory to prepare for an immediate response should the same invader be encountered again. It usually takes 7 to 10 days for a healthy human body to produce the first batch of antibodies when new pathogens invade. The time will be longer for a person with a weaker immune system. On the 2nd encounter, the body can produce antibodies faster because the B cells already have the "patent" to create them. In animal tests of mice given ganoderma orally, there was an increase in IgA, IgM and IgG compared with those in the control group. It is important to reduce the time between being attacked by pathogens and creation of new antibodies to lessen the occurrence of sickness. First-line defense - reduce the possibility of infection and lessen the occurrence of sickness. Second-line defense - clear away pathogens, avoid allergies, strengthen immunity thereby speed up recovery in the event of illness. Phagocytes swallow the pathogens and send out messages. NKC followed by T cells start their elimination work. Th cells memorize the pathogens, inform NKC of information gathered on the pathogens and so assist their work. 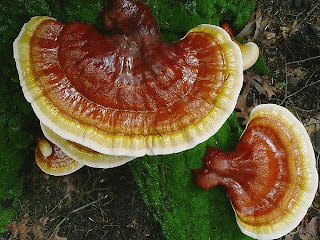 In a nutshell, that is how ganoderma modulates our immune system. Please email me at askfuiping@gmail.com if you wish to strengthen your immune system using Yung Kien Ganoderma.